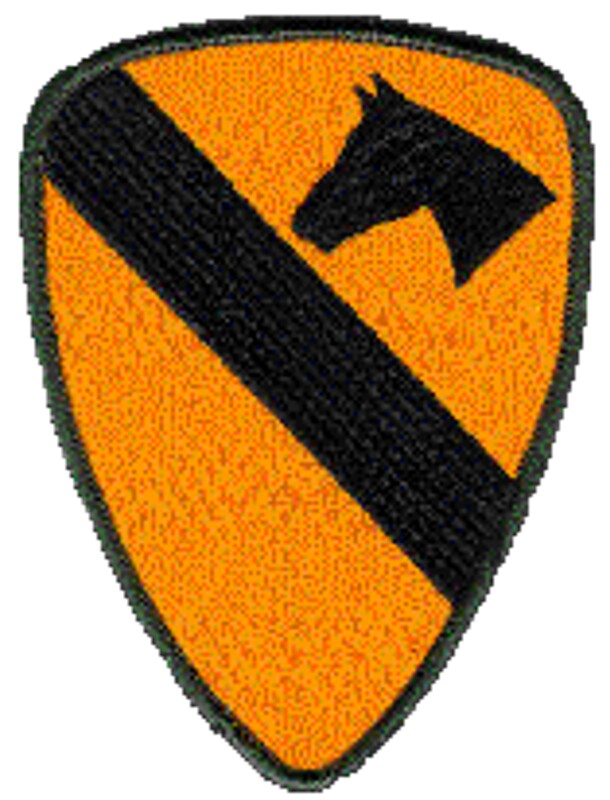 When the Army decided to form the 1st Cavalry Division it sent out a Directive requesting for people to submit a design for the Division’s Shoulder Insignia or Patch. It was a requirement that the Insignia conforms to three things. 1. It must be of only two colors. 2. It must be easily recognizable so that it’s men could reassemble around it either during or after battle. 3. It must instill a common devotion and camaraderie. Colonel and Mrs. Ben Dorcy submitted the winning entry. Colonel Dorcy was the Commander of the 7th Cavalry Regiment, 1st Cavalry Division at the time. Mrs. Dorcy was cutting up a Dress Blue cape. The inside was a bright yellow. Cavalry colors have always been Yellow and Blue. The Colonel drew up a design for the patch which included a shape of a “Norman Knight’s Shield with a background color of yellow. It had a blue stripe that ran from the upper left corner to the lower right. It also had a silhouette of a Horses’ head facing the Stripe . Later the blue was exchanged for black. The patch is over 5 inches high so it could be easily seen during sand storms. Mrs Dorcy was presented a certificate honoring her as “Mother Dorcy” the official Mother of the Division. The Stetson is worn by members of the 1st Cavalry Division and is the most recognizable of Military headgear along with the Green Beret. It is also the one form of headgear that most imposters and Wannabes wear. Why is that? To really understand, we must look at the history or the Stetson. The Stetson has long been the headgear of the Cavalry. The Stetson is Black with a 3 inch brim and a black leather chin strap. When mounted, the chin strap is under the chin holding the hat in place. When not mounted the chin strap is behind the head. The cord that goes around the hat comes in various colors. General Officers wear a solid Gold. Field and company grade officers wear a black and gold cord. Warrant Officers wear silver and black cord while the enlisted wears a yellow cord. There are branch colors as well. The Artillery wears a red cord and the infantry wears a blue cord. On the ends of the cord are acorns that come to the end of the brim. These were used to help keep the Troopers awake during long trail marches by tapping on the brim as the horse stepped. Although another unit began wearing the Stetson prior to Vietnam, LTC John B. Stockton, Squadron Commander of the 1/9th Cav, made it official by having it the 1/9th headgear. LTC Stockton was as proud of his Stetson as he was of his men. A crossed sabers insignia and the rank of the person are placed on the front of the hat. Those not on active duty may also place CIBs (Combat Infantryman Badge) CMBs (combat Medic Badge) as well as other awards on the hat, however, those on active duty may not. The Stetson and the shoulder patch are truly rallying points. In October of 2010, the 1st Squadron 9th Cavalry Regiment (of which I belong to) was holding one of our reunions in Columbus, Georgia. One of our side trips was to the National Infantry Museum. After my group left, another group of Bullwhip members arrived., A man saw the Stetsons and told the people that he was with “Those guys are Cav”. He went over to them and asked if anyone knew Patrick Bieneman. Three days later we were talking. We both were in Charlie Troop 1/9 in 1968 and had served in the Blues (Infantry platoon). We had lost contact after had been injured on a mission. Forty three years later we met for the first time. The Stetson is worn with Pride and Honor. The men and now ladies that wear the Stetson have earned the honor to wear it and will fight to defend its honor. 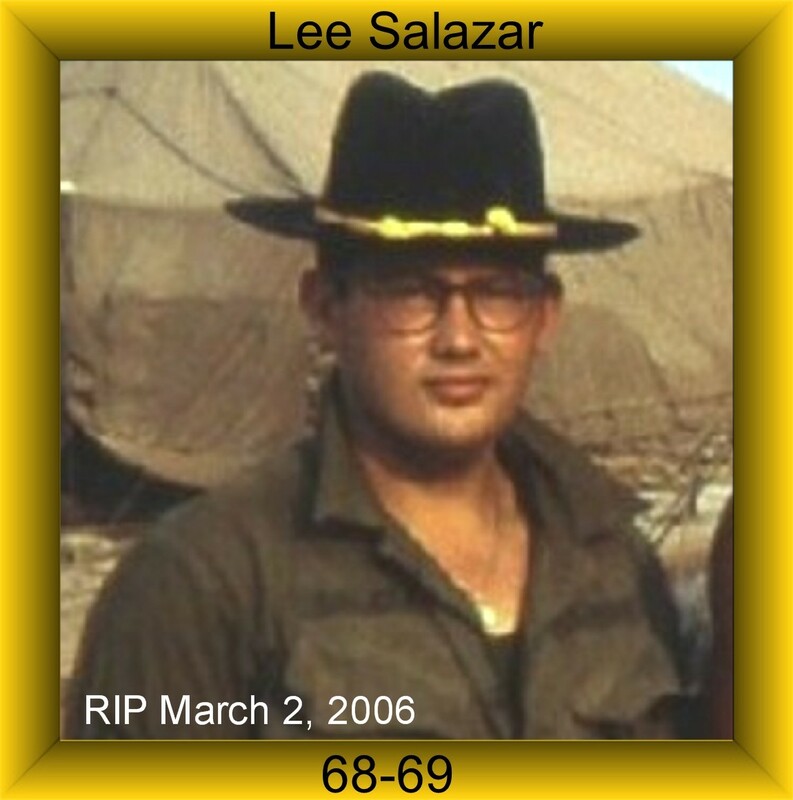 *1 Lee Salazar aka Leopoldo J. Salazar will always be a Charlie Trooper. He was the kind of man you wanted for a friend. He was the kind of man you wanted to have your back. Lee and I were to meet for the first time in 37 years when he suddenly passed away with a heart attack. Lee’s brother Rolando was continued Lees’ website which I think is the best one that I have visited. You can find it at http://webspace.webring.com/people/ur/rolando67/leesaslazar1/ . I encourage you to visit it. I have had a lot of problems getting this website to go straight through. If you click on this link, it will direct you. The tradition of awarding spurs has its roots in knighthood, where the awarding of spurs symbolized entry into the ranks – and fraternity – of mounted warriors. Usually the squire aspiring to knighthood had to perform some task or deed on the battlefield or tournament field (tournaments were considered like our training maneuvers) to “win their spurs”. The spurs themselves where buckled on during the investiture to knighthood usually during a Mass or some other religious ceremony (Knighthood itself was considered sacramental, if not a sacrament itself). Thereafter, it was the spurs that symbolized that a man was a knight – not his sword, horse, or armor. No matter how financially destitute, a poor knight would part with everything else before his spurs. The primary act of degradation (removing someone from the knightly class) was to have another knight cut off the offending knight’s spurs. So much for the myths of time. It is not known when the ceremony for awarding spurs for outstanding performance started in the U.S. Cavalry. Today the Order of the Spur recognizes individual qualifications for those in a Cavalry unit. The privilege of being awarded spurs in any Cavalry unit comes with hard work and challenges. For an individual to qualify and compete for the Order of the Spur within the unit, the Cavalry soldier must first meet or exceed established standards of performance. Once documented as having achieved the performance objectives, the candidate is designated to participate in the Spur Ride exercise. This exercise requires completion of numerous additional tasks. Upon successful accomplishment of the requirements the senior officer awards the spurs to be proudly worn throughout the trooper’s Cavalry career. The same MOI that covers the “Cav Hat” covers the qualifications required for the present troopers of the First Team to “earn their spurs” and also describes the spurs authorized for wear and how to wear them. Most veterans of the First Team will have no remembrance of earning their spurs since most of the unit spur programs came into being after the Division arrived at Fort Hood. Those troopers that rode horses in West Texas with the Division and rode horses earned their spurs learning to be a horse cavalry trooper. Those troopers that have been fortunate enough to serve in the Horse Cavalry Detachment have been earning the right to wear spurs for many years. The Division’s MOI states, “The ‘Order of the Spur’ will not be awarded to any Trooper based on arbitrary or meritless criteria such as rank, time in service, branch, and ability to endure hazing or other degrading behavior. Rather, Troopers must be in good standing within their formation (i.e. have no incidents of misconduct, record of adverse actions, or failures in obtaining basic Army standards) and then ‘earn’ the right to wear Cavalry Spurs through their demonstrated proficiency at both technical and tactical skills expected of Troopers assigned to the Division.” Troopers may lose their right to wear spurs if they “fail to remain in good standing such as demonstrating an act of indiscipline.” The Troopers are awarded a certificate and are able to wear ‘Silver Spurs’ once they have completed the Spur Ride (test) and been approved. Those who have earned their spurs may also be awarded “Combat Spurs” if they conduct at least two combat patrols or missions outside of the Forward Operating Base, Combat Outpost, or camp. Being flown from one secure location to another does not constitute a patrol but does apply to pilots or air crewman with the primary duty of flying combat missions. Combat Spurs are “Gold Spurs” while those earned in peacetime are “Silver Spurs”. Neither the Silver or Gold Spur are more prestigious than the other. The wearer may wear either color but the spurs being worn must match. The Prince of Wales Spur, pictured above is the standard spur worn with either a black or tan strap. 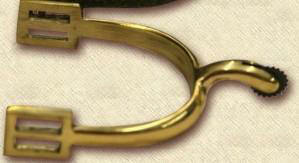 The 1859 Cavalry Spur, pictured below, is an alternate style of spur that may be worn. When are Spurs appropriate for wear? The answer to that question is whenever you are wearing a “Cav Hat” or riding a horse – unless you are presently an active duty Trooper. Active duty Troopers are bound by uniform policies and wear of the Spurs is covered in the Memorandum of Instruction. All former Cav Troopers may wear their Spurs at their own pleasure but are encouraged to wear them to all gatherings of Cavalry veterans and unit reunions. The “Cav Hat” is always appropriate at patriotic observances like Veterans Day, Independence Day and Memorial Day. As with the “Cav Hat”, never wear your Spurs in circumstances that would bring discredit to the Cavalry or your unit. Taken from the 1st Cavalry Divisions’ MOI ( extracted off of the 1st Cavalry Division Association web page at www.1cda.org . c. Who is authorized to wear the Spurs? (1) There are two different categories of Spurs awarded in the 1st Cavalry Division: silver and gold. Neither Spurs are an entitlement for serving within this division. The “Order of the Spur” will not be awarded to any Trooper based on arbitrary or meritless criteria such as rank, time in service, branch, and ability to endure hazing or other degrading behavior. Rather, Troopers must first be in good standing within their formation (i.e. have no incidents of misconduct, record of adverse actions, or failures in obtaining basic army standards) and then “earn” the right to wear Cavalry Spurs through their demonstrated proficiency at both technical and tactical skills expected of Troopers assigned to this Division. (2) Each Brigade will establish a program to award the Silver Spurs which assesses and measures the warrior skills a Cavalry Trooper should possess as well as their overall physical fitness. The program will be called “Spur Ride”. The assessment may be executed over as short of a time period as 24 hours with required prerequisites or over a course of time up to three months and during the duty week. Hazing is not authorized. Units should conduct a “Spur Ride” twice a year to include during combat deployments. Spur Certificates should be presented during a suitable ceremony which reflects the achievement of the Trooper. Units will produce and design their own Spur Certificate signed by the commander and CSM. (3) Troopers may lose the right to wear the Spurs if they fail to remain in good standing. www.1cda.org On left hand side of the home page click on Hat and Spurs. Click MOI at top of page. *1 Information and extractions from the 1st Cavalary Division Associations website.